Made from pressed aluminium, and features a neat seamless frame. 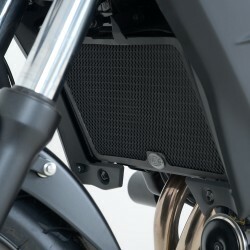 It improves the look of the bike and protects the expensive and vulnerable radiator from flying debris. Easy to fit, no permanent modifications needed. Suitable for all Honda CB500X/F, all years.